The Hilbert-Huang transform (HHT) and the Empirical Mode Decomposition (EMD) have offered a breakthrough in the analysis of nonlinear and non-stationary data. This signal processing technique has been used with great success in many applications where traditional methods do not apply. 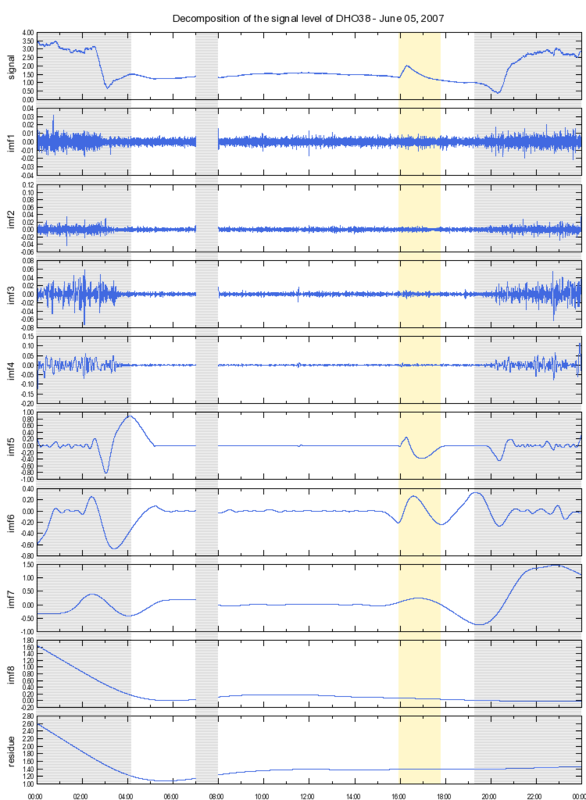 The author has written this software to see how the Empirical Mode Decomposition (EMD) technique helps in the detection of SIDs from recordings of the signal levels of VLF stations. Nevertheless, the application of this tool are not limited to this topic. Settings: S_number 2. Max Std Dev 0.30. Max IMF 16. Epsilon 1.00e-09. Aberrant Limit 1.80e+308. Analysis done. Total of 8 IMF found. In this example, the sifting process leads to a decomposition into 8 IMFs. We can see that few components are necessary to completely represent the original data. An IMF is deemed valid its when standard deviation gets below a predefined threshold (0.3 in this case). When searching for a new component, from two to four siftings steps are necessary to obtain an IMF meeting the validity criteria. This example shows how the number of extrema and zero-crossings reduces from IMF 1 to IMF 8, thus ensuring the convergence of the algorithm. Each new IMF contains a lower-frequency oscillatory mode. The decomposition is stopped when a monotonic residue is found. An example of decomposition obtained on a day with a SID is shown here. It clearly shows how the components (particularly IMF 5) react to the disturbance. Under Windows, the binary runs directly without installation. Under Linux, the classic installation steps are used: ./configure, make, make install. Please read the INSTALL file from the package for details. s   'S number'. Used as termination criteria. Strictly positive integer. Defaults to 2.
d   Maximum Standard Deviation. Used as termination criteria. Strictly positive real number. Defaults to 0.3.
n   Maximum number of intrinsic mode function (IMF) to search for. Strictly positive integer. Defaults to 16.
e   Tolerance on RMS value of IMF. Used as termination criteria. Strictly positive real number. Defaults to 0.000 000 001.